On our way to the Feast this year, my wife and I met up with some of our family to tour the USS Alabama. That’s the point. That’s why you build a battleship. From the wooden warships of long ago to the ironclads of the Civil War to the dreadnoughts of World War I and beyond, the reason has always been the same. Battleships exist to blow a hole in the other guy’s stuff before he does the same to yours. On board the Alabama, my brother-in-law and I couldn’t resist the opportunity to climb the conning tower overlooking the ship. The stairs led us to a platform with an incredible view—even from 100 feet up, the Alabama remained an imposing exhibit. But it wasn’t always an exhibit. I had to keep reminding myself of that. When the Norfolk Navy Yard began its construction in 1940, the point was to build a war machine, not a museum. When the United States Navy shelled out the $77 million to purchase it (the equivalent of over $1 billion today), it wasn’t interested in charging admission and opening a quaint little gift shop. It wanted a battleship to do what battleships do best: fight battles, conduct raids, bombard targets, and sink ships. 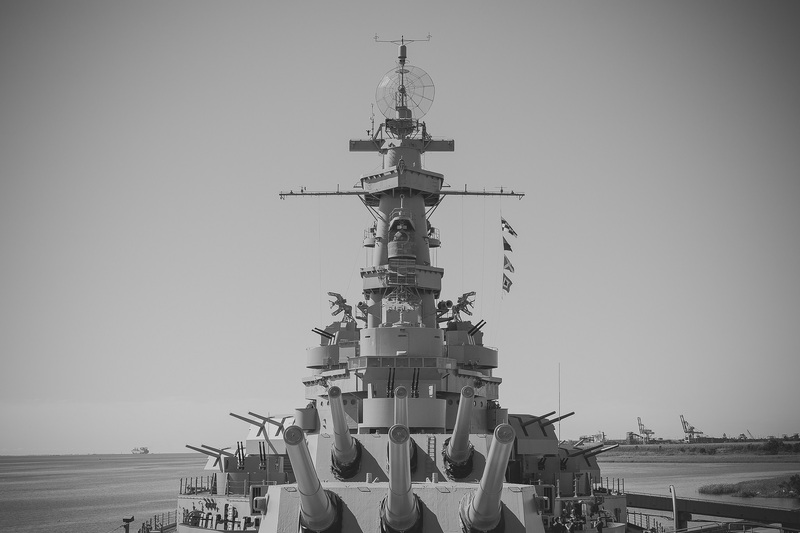 The USS Alabama did all those things, and it did them well. 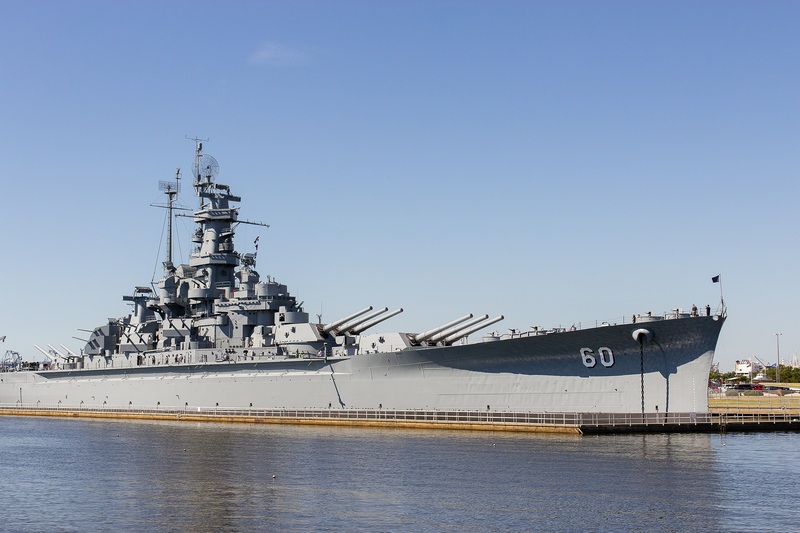 At 680 feet long, the Alabama is armed to the teeth with 129 guns of varying sizes and payloads. It was operated by a crew of roughly 2,000 sailors and officers, and it earned nine battle stars on the Asiatic-Pacific Campaign Medal for its service during World War II. Today it sits quietly in Mobile Bay, Alabama, while families and elementary classrooms admire it as an ancient relic from long ago. They walk down its halls, climb its ladders, and pretend to fire its guns, snapping photos along the way. It’s hard to imagine that 70 years ago, the same ship was serving in the most devastating war our world has ever known. Veterans Day came and went this past week—a day for those of us in the United States to honor the sacrifice of those who have served in our nation’s armed forces, who put their lives on the line for the sake of their nation, knowing full well they might never return to their homes and families. The sailors aboard the Alabama were veterans, but they comprise only one piece of a much larger puzzle. For all its grandeur, the Alabama was only ever one ship in an armada, which was only one armada in a navy, which was only one navy in a world bristling with navies and militaries and soldiers preparing, always preparing, for war. World War I, once called “the war to end war,” ended almost 100 years ago. War didn’t. It’s evolved. One century later, we’re fighting with better guns, better bullets, better armor, better everything. This year alone, the United States set aside $598 billion for its military budget. Billion. The only two things we as a nation spend more on are Health Care and Social Security. That’s the thing about war. It isn’t just a thing that happens; it’s a thing we invest in. We don’t just practice war, we learn it. We have schools and academies devoted to training skilled soldiers and officers who eat, breath, and live the art of war. We have laboratories and research centers designed to produce the latest and greatest equipment for the battlefield. War is an attitude. War is a mindset. In our world, war is a career, a tradition, and a solution. I wish that was describing today. I wish with all my heart that today was the day when all nations dismantled their weapons and turned them into tools that enhance life instead of ending it. I wonder, what would a $598 billion plowshare look like? What would the world be like if we stopped training people to kill each other? What would it be like if war wasn’t an option anymore? If we invested more time and money into healing, restoring, and creating instead of destroying and breaking and killing? We don’t live in that world. Not today. And the road to that world will be a long and harrowing one—a time of “great tribulation, such as has not been since the beginning of the world until this time, no, nor ever shall be” (Matthew 24:21). I don’t look forward to that. I’ll tell you what I do look forward to, though: what comes after. I look forward to the day when the wolf lies down with the lamb. I look forward to the day when the leopard lies down with the young goat. I look forward to the day when the calf and the young lion and the fatling will live in peace together, and I look forward most of all to the day that a little child will lead them instead of washing up on the shore while his distraught father holds him tight and cries the tears of a broken man. That’s what I look forward to. I am eternally grateful for the service of the men and women who have risked and who continue to risk their lives to do what they believe is necessary to protect their country, but I am even more thankful that a day is coming when the jobs of those men and women will be obsolete—a day when “God Himself will be with them and be their God,” when “there shall be no more death, nor sorrow, nor crying. There shall be no more pain, for the former things have passed away” (Revelation 21:3-4). 3 Responses to "They Shall War No More"
So appropriate that this was sent out this evening just after we had been seeing the horrible things taking place in Paris. I’m sure you wrote this before you even knew about the tragic events unfolding there. How desperately this world needs God’s government! Thank you Jeremy for sharing your God-given talent for putting together such inspiring articles for all of us to read. A blog post after my own heart and as already stated, timely. God knows what we need to hear. Our best to you both. I love how you are inspired to put things. Keep it up, certainly our Great God is inspiring you.